Travel with Kevin and Ruth! : Another mouse problem! A couple of weeks ago, the "Check Engine" light had come on, and I hadn't really thought much about it because it's such a common thing. Usually related to an emissions problem like a bad oxygen sensor, but can be as simple as a faulty or loose gas cap. But now, I understood why it had come on. As I looked under the car, I noticed that the wiring to the oxygen sensor wasn't right. I had only taken a quick glance, and most of it was hidden under a splash shield, but it looked like there was a broken wire. So I took the little blue car up to the shop yesterday for a closer look. Yikes! That doesn't look right! And I knew right away what caused it. You could easily see their little teeth marks on the wiring. I thought maybe I could repair the wiring, but when I took it off, one of the wires was broken right where it went into the sensor itself and it didn't leave any room to repair it. This is what it's supposed to look like! And so I decided the best repair route would be to buy a new oxygen sensor. I called Canadian Tire ($99.99 plus 11% tax), Napa Auto Parts ($105.00 plus 11% tax) and the local GM dealer ($205.00 plus 11% tax) before checking where I figured would be the best deal anyhow... the American website RockAuto.com. I've used RockAuto quite a few times in the past for parts for the motorhome, and they always come through with the best deal. Sure enough, including shipping to Canada, duty, and taxes... $62.74, and that's for the exact identical original equipment item that I removed from the car! Not aftermarket. How is it that we are so badly ripped off for most things up here in the great white north? Especially RV parts and car parts. I can't figure it out. Anyhow, I reinstalled the old one for now. The car is still driveable without any issues. 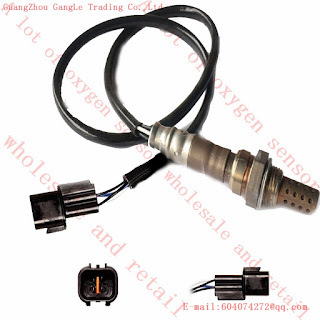 The 2006 Chev Aveo and Pontiac Wave had two oxygen sensors, one that is ahead of the catalytic converter and one below it. This one is the "downtream" one that apparently only senses exhaust temperature, or so I've read. So it doesn't affect fuel economy as much as the upstream one would if it was bad. Should arrive here by September 8th, the shipping info says. Mice are sure destructive little critters. Being in the car business, I've seen some vehicles badly damaged by mice. Hopefully poor old Sherman has survived being parked by our daughter Lindsey's for a whole year. We'll find out next month! We have dozens of squirrels and chipmunks that neighbors feed. Have a friend that lost a wiring harness to them. Yep, they can be almost as much of a nuisance as mice! Those critters can do some damage alright. A few years ago our on board gas generator could not get gas from then fuel tank and did not find the problem until we had the in tank fuel pump replaced, dropped the gas tank and a 2ft section of gas hose had been chewed, That replaced and all is good now. No compassion here for the mice when they are destroying your hard-earned investment in your property. When you store the car for the winter in the garage, I wonder if sprinkling some rat poisoning around the outer perimeter of the car would help the situation. We haven't had a problem yet with storing it over the winter in the shop. Kevin thoroughly goes over it with rust protection oil and then we park it on a sheet of plastic and then put thick goopy greasy on the plastic all around the tires. There is no way the mice can get to the car. This damage was done when the car wasn't stored for the winter. During our working season it sits either in the shop or outside from one week to the next as it really is only used once a week to go to Swift Current for the recycling and our groceries. The problem is that the car is usually up in the shop and the kitty last year was in the house with us. Love RockAuto...we get our car parts from them, too. Mice are bad, but rats are worse! So far Kevin is liking Rock Auto! We are glad that we can use them and still get the parts shipped up here to Canada for less than buying them anywhere here in Canada. I just doesn't make any sense at all! Since our trip to Canada I have often wondered what drives prices so high there for everything. With all the internet purchasing and people crossing the border it must add up to a lot of lost Canadian business. Chris, Canada has a population of around 36 million, and US has a population of around 320 million. I wonder if economies of scale have anything to do with it. Cost per unit is higher because of smaller scale for a smaller population. I'm sure I couldn't isolate that reason as the only reason, for example, duties and import taxes for out-of-country products. Those mice can get anywere:( I leave mice bait permanently in several locations, just in case. Unfortunately if the car is sitting outside this isn't possible with it being a campground that has children and dogs around. If it is up in the shop then yes, we have some poison blocks up there but not sure how much that helps to keep the mouse population down. Yes, but this isn't really an item that you would by used. Mice are horrible little creatures. I am glad we have Bella. They seem to stay away when she is on duty. I usually click on LIKE on your post on Facebook before I get to read it on your blog. But when I saw "Another Mouse Problem", I just couldn't LIKE it - dang lil destructors!!!!!!!!!!!!! I can totally understand you not wanting to like that post! I don't know why facebook hasn't come up with a "don't like" button yet. I love RockAuto too! Especially their very reasonable shipping prices. And guess what I found in one of MY recycling bottles the other day??? No Way, you didn't really find a mouse in your bottle, did you? Glad that you know that it was no squirrel that did that. Anything bad that happens, it's due to dem mice or perhaps a dirty rat. Squirrels on the other hand are cute and deserving of being given handouts and access to bird feeders.